December 17th, 2015 | News and Events, Wheaton World Wide Moving. Direct Lease Driver of the Month, Randy Mann, Martinsville, Ind., has 40 years of experience as a household goods driver. He maintains a top driver performance rating. 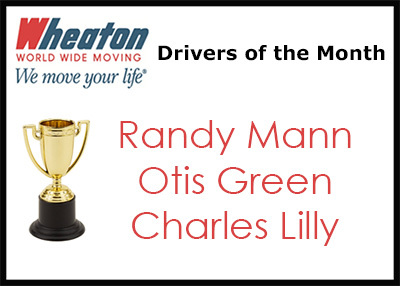 This is Randy’s fifth Driver of the Month award, and he was also selected as Driver of the Year in 2005. Otis Green, Crown Moving & Storage, Inc., Indianapolis, Ind., earned Wheaton’s Permanent Fleet Driver of the Month award. Otis has nearly 60 years of experience as a professional household goods driver. This is his tenth Driver of the Month award. Otis was also selected as the JB Cupp Award winner in 2013. Charles Lilly, Capital City Transfer, Inc., Verona, Wis., earned Wheaton’s Intermittent Fleet Driver of the Month award. Charles has two years of experience as a professional mover and this is his first Driver of the Month award.